See below to prepare for first test. 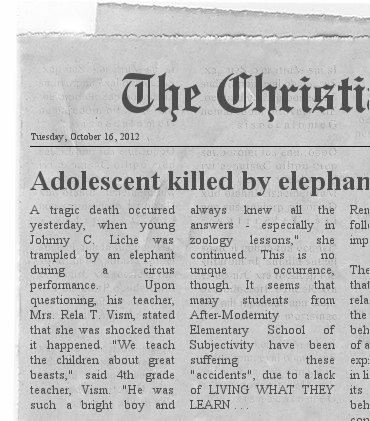 A tragic death occurred yesterday, when young Johnny C. Liche was trampled by an elephant during a circus performance. Upon questioning, his teacher, Mrs. Rela T. Vism, stated that she was shocked that it happened. “We teach the children about great beasts,” said 4th grade teacher, Vism. “He was such a bright boy and always knew all the answers – especially in zoology lessons,” she continued. This is no unique occurrence, though. It seems that many students from After-Modernity Elementary School of Subjectivity have been suffering these “accidents”, due to a lack of LIVING WHAT THEY LEARN . . .
from L. appropriationem (nom. appropriatio) “a making one’s own,”specifically regarding education – to take knowledge and apply it to actual living. This is an issue on all fronts of life, Christianity not being immune. It is not uncommon for people to “know” something as true, yet not live it out. In fact, the knowledge, for some, proves to most often be empty at best and false at worst. The Fathers understood the difference between Knowledge, Understanding and Belief (latin, notitia, assensus, fidicia). It is only when one believes (fiducia) a something as True (a capital “T” being Objective Truth), will one apply it to their lives. Many would deny the existence of such objective truth, yet ironically “believe” that statement to be absolutely true. Everyone believes, it’s just some believe the elephant is a fact only in the story and others find the truth in the sound of his trumpet and the pound of his footstep. They need not be mutually exclusive, the information and the thing. It is just that the information must always point to the thing – AND THE THING IS THE POINT, NOT THE SOUNDS AND SYMBOLS ABOUT THE THING . . . NOT JUST THE LANGUAGE. This is where Anselm, Descartes and even Aquinas helped us a bit in their discussions of ontology – namely that something can be shown to exists because we can conceive of it in our minds. They apply this mainly to God and His existence. One might argue that could mean that because a little girl could draw a pink, panda with purple polka dots, dancing with monkey on a high-wire made of noodles, over a sea filled with mermaids that such things exist. This takes the argument further than it intends. It would merely prove that pandas, monkeys, colors, fishtails, women, oceans, dance positions and noodles exist. The unusual and unrealistic in the painting is just a combination of reality, otherwise the child could not conceive of them in their mind. This is coupled with the fact that He provides some freedom to those who have been reborn and can thus be alive and make choices. It CANNOT be said that man ever has freewill, as a “free-will” would be able to do anything it wants to do anytime it wants to do it – only God can do that. Rather, we live within the realm of responsibility and Divine Sovereignty, as D.A. Carson writes. Yet, how if God’s WILL is sovereign over all can we ever make a choice. Well . . . we can and we cannot. This is where the principle of complexity needs to replace ideas of contradiction. Two items may only seem to contradict, unless they are elementally opposed – then they contradict. Otherwise, they may be two corollary attributes of a thoroughly complex system. Here that applies to the reality that the tension between say, the imperatives (commands) in Scripture and the fact that God has no thing outside of His WILL, is no tension at all – it only seems to be. This applies to sin and the Sovereignty of God as well. His Will is complex enough to contain His will (providence with man) and it is neither a contradiction, nor a diluting of the integrity of God. God’s providential will (the filial application of God’s Sovereign WILL to His relationship with mankind) lies always within His Sovereign will, namely because it is born out of it – as all things are. Yet, it is within the complexity of His will a real realm of [limited] choice – namely to please or not to please Father. 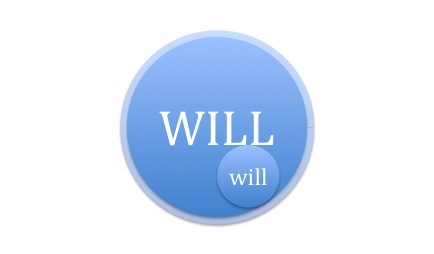 These two categories are essential to even begin a dialog on the Will/will of God. For truly, no thing can ever thwart the WILL of God. I call this the Abimelech principle, because this is a situation that we are faced with too often as Christians – namely, a non-believer providing a better example of commitment to Christ or to the Gospel than us; or in the case of Abraham (Genesis 20), being rebuked by a non-believer over ethical issues. The truth is that I do not share Christ with others enough; I do not bear witness to the truth enough; I say that I cherish Him, but clearly don’t act as if I want enough others to cherish Him. According to this video, that might mean that I am hating people. I am not trying to be melodramatic here. I know he, like Abimelech, is an unbeliever – but, maybe he’s right. I do not share Christ with others enough. Of that I repent. DailyTheocentrism: Jesus was 100% Man during the Incarnation, but not like any other man . . .
6 There came a man sent from God, whose name was John. 7 He came as a witness, to testify about the Light, so that all might believe through him. 8 He was not the Light, but he came to testify about the Light. 9 There was the true Light which, coming into the world, enlightens every man. 14 And the Word became flesh, and dwelt among us, and we saw His glory, glory as of the only begotten from the Father, full of grace and truth. 18 No one has seen God at any time; the only begotten God who is in the bosom of the Father, He has explained Him. Maybe, in light of ALL of Scripture, we might see this for what it is: a product of Western Modernity upon the text when we hear of a Jesus, just like us; a Jesus who grew in progressive knowledge of His own deity/lordship/sonship.